The tenth of thirteen children, Bessie Coleman was born in a one-room, dirt-floored cabin to the illiterate children of slaves. Her father left the family when she was nine and though she was limited to eight grades at the nearby one-room schoolhouse, she was intelligent and ambitious and informed her mother she would someday "amount to something". She worked as a laundress and manicurist as she struggled, sought and finally found a goal for her life: to become a pilot. When no US flight school or white pilot would teach her to fly, Bessie refused to be slowed by racism in the pursuit of her dream. A mentor suggested that Bessie go to France to flight school, he insisted the French were not racists and were the world leaders in aviation. She constructed a plan and attended the Berlitz School in Chicago for French lessons as the first step. 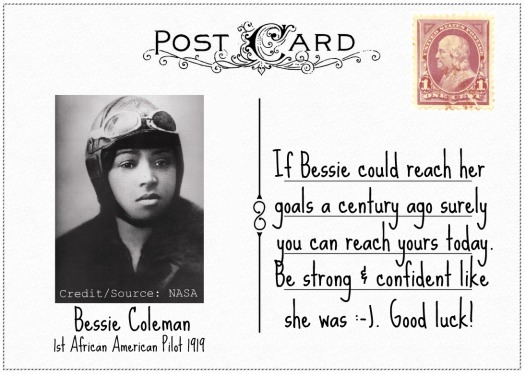 Never losing sight of her goal to "amount to something," she attained the world's first pilot license for an African American woman and first international license for an African American. She became a media sensation when she returned to the United States known as "Queen Bess." She never lost sight of her goals..
She didn't allow circumstances to box in her dreams and aspirations.. When she was told "no" in one place, she looked for "yes" in the next, she was persistent..
She believed in herself and surrounded herself with others that believed in and supported her.. Learn from an amazing woman. Here's to achieving your goals, and supporting those of other women in your life, in 2011 - May you fly high!